Set the unicode options for code generation. 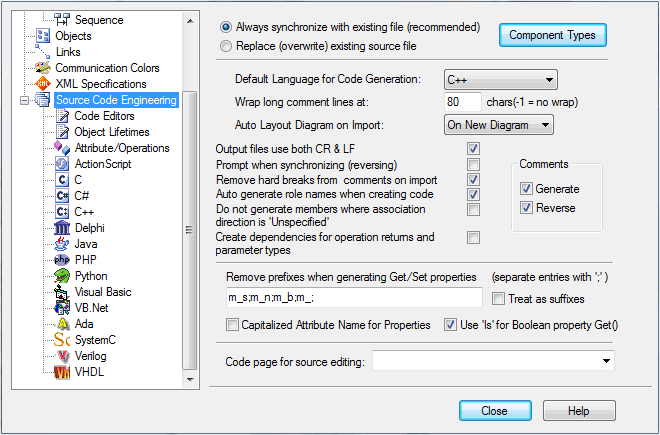 These options are accessed the Source Code Engineering page of the Options dialog (select the Tools | Options | Source Code Engineering menu option). Most of the settings are self-explanatory. The Remove prefixes when generating Get/Set properties field enables you to specify prefixes used in your variable naming conventions, if those prefixes should be removed in the variables' corresponding get/set functions. Click on the Component Types button to configure what elements should be created for files of any extension found while importing a source code directory. It is worthwhile to configure these settings, as they serve as the defaults for all Classes in the model. You can override these on a per-Class basis using the custom settings (from the Code Generation dialog).